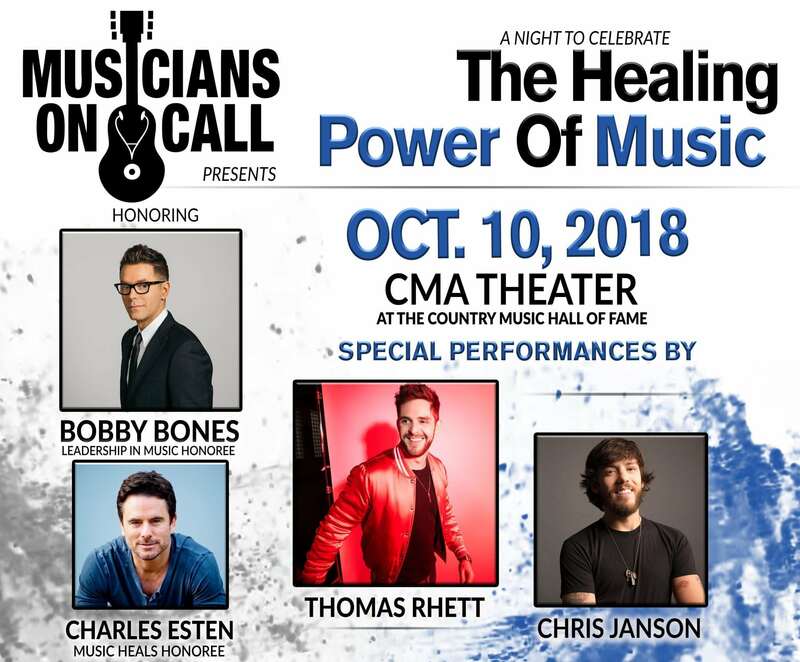 is hosting A Night To Celebrate the Healing Power of Music on Wednesday, October 10 at the CMA Theater at the Country Music Hall of Fame and Museum in Nashville. The event will honor Nationally Syndicated On-air personality and Musicians on Call Board Member Bobby Bones with the Leadership in Music Golden Ukulele Award. The evening will also honor CMT’s Nashville star and Musicians On Call volunteer and supporter Charles Esten with the Music Heals Golden Ukulele Award. Current multi-CMA Nominee Thomas Rhett and Warner Music Nashville’s rising superstar and 3-time CMA nominee Chris Janson will be featured in special performances in the CMA Theater following the exclusive VIP reception in the Grand Foyer. Tickets to the concert become available to the general public on Sept. 13 and can be purchased at www.musiciansoncall.org/nash or www.bobbybones.com. Golden Ukuleles will also be presented to Outstanding Volunteer Guide Mary Lee Bennett and Outstanding Volunteer Musicians Chris Swift and Laura Vance for their commitment to Musicians On Call’s Bedside Performance Programs at Nashville-area hospitals. Musicians On Call Presents A Night To Celebrate the Healing Power of Music is sponsored by Warner Music Nashville, Red Light Management, CMT, City National Bank, Jobu Presents, Tim Scarvey, CAA, RIAA, UMG Nashville, MusiCares, Deborah Robbins, HCA, the Grand Ole Opry and ASCAP. Limited sponsorship opportunities are available for this one-of-a-kind night. Bid now or purchase sponsorships at www.musiciansoncall.org/nash. Meet Paige Hansen, Our Featured Volunteer from Nashville!